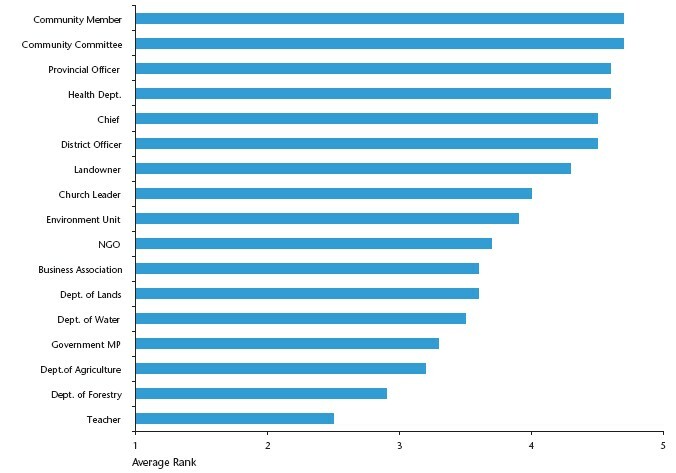 In Fiji, community members and committees were perceived to have the highest level of influence, followed closely by Provincial Officers and the Health Department (Figure 9). The decision-making and influence surveys in Fiji differed from the other countries in that they were conducted with groups (men, women and youth) rather than with individuals within the groups. The results can therefore be interpreted as the consensus view of each group. Fiji participants were surveyed about influence and decision making regarding water infrastructure, water sources, community health services, consumption of kava, utilization of land and community funding. Men, women and youth generally perceived similar groups to have influence over any particular issue, however, women seemed less clear of the role of some groups, answering “don’t know”, in particular for NGOs, Department of Land and the Environment Unit. Although participants could attribute the level of influence over five rank categories it was notable that the majority of responses (81%) were made at the extremes of the scale of either “big influence” (rank 5) or “least influence” (rank 1) with very little in between. Where groups were ranked in the middle of the scale, it was usually by the youth groups. Perception of influence did however vary depending on the issue in question. Government Departments were perceived to be influential on issues associated with their core business, for example, the Department of Water Supply was perceived to have influence over water infrastructure but (predictably) not over kava consumption. 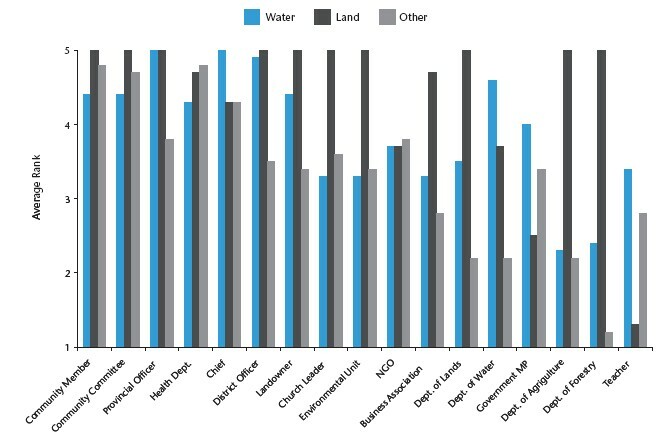 The Health Department was perceived to have influence over community health services (‘no dispensary’), as well as community related issues of water and kava consumption (Figure 10). Chiefs and Landowners were perceived to have significant influence on all issues except for ‘lack of funding for communities’ and ‘consumption of kava’, respectively. Church leaders were perceived variably by participants, but were generally rated as having relatively low influence. Exceptions to this included a high level of influence over water infrastructure (Naimasimasi, Naivuvuni & Vitawa), land utilization (Naivuvuni), and kava consumption (Vitawa). Teachers ranked consistently low across all priority issues; an interesting community perception considering the role teachers play in educating forthcoming generations.